"My iPhone 6 won't connect with iTunes. I tried restoring it, restarting. I even completely erased it, and it still won't connect." When connecting your iPhone 6 with iTunes, the last thing you would like to experience is receiving the error message that iTunes could not connect to iPhone. Background reasons for this are many, mainly known as invalid response or value missing. 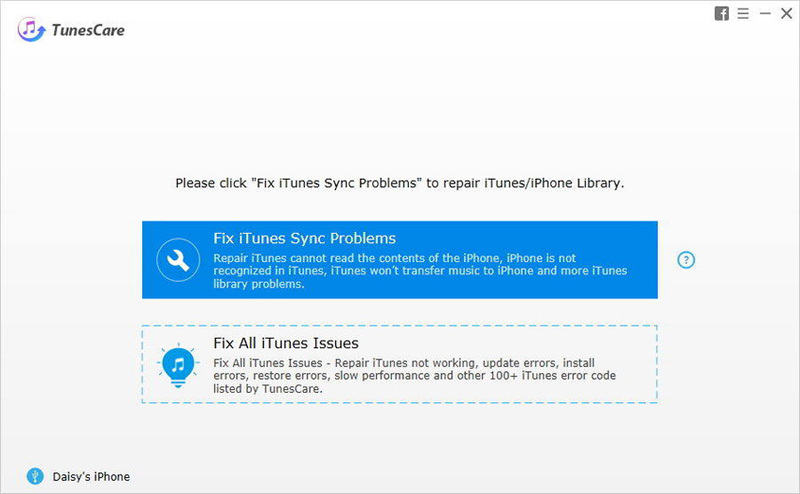 In this article, you can check out how to fix iPhone 6 (Plus)/6s (Plus) cannot connect to iTunes error. Tip: Before you taking below methods, it's worthy trying to change another USB cable or port. If lucky enough, you can have this problem resolved. A freeware called Tenorshare TunesCare is able to quickly reorganize iTunes library files and repair iTunes drivers to fix potential connection errors. If you find the iTunes doesn't recognize iPhone 6 while the USB cable is well-functioning, it's time to give TunesCare a try. Download it on your PC/Mac and click on Fix All iTunes Issues. After repairing process finishes, you are good to reconnect the device with iTunes. In some cases, if the iPhone 6/6s is disabled and locked with a passcode, you will be prompted to enter the passcode first or iTunes won’t connect. It will become a dilemma for those who forgot unlock password or had screen unresponsive. To solve this problem, you can manually put the device into Recovery Mode for detecting. When iPhone 6 is connected, press both Home button and Power button for a certain time. Release when you see the iTunes logo. A message like “iTunes has detected an iPhone in recovery mode” will pop up. If this doesn’t fix iTunes not recognizing iPhone 6 even in recovery mode, keep reading for more solutions. Apple always encourages users to use the latest version of iTunes. If the iTunes version installed on your computer is out of data, you might have problems when connecting an iPhone with iTunes. Updating the software can fix it. If you are using Mac computer, just click on the iTunes menu and select Check for Updates. On a Windows PC, select Help > Check for Updates. However, if iTunes cannot detect iPhone 6/6s but the computer does, you will then consider reinstalling iTunes. Remember it's necessary to delete iTunes-related settings and programs before a clean install. For Mac users, open Finder and select Applications > iTunes > Get Info > Padlock. Enter your admin password if asked. Under Sharing & Permissions tab, change the permission to allow everyone to Read & Write. After all these, you can go back to the Finder window and drag iTunes to recycle bin. Windows user will need to uninstall iTunes, Apple Software Update, Apple Mobile Device Support, Bonjour and Apple Applications Support before re-downloading iTunes. If your iPhone 6 is not getting connected to iTunes and the USB driver is showing an error symbol on Windows PC, you will need to reinstall the device driver. 2. Find usbapp 164.inf or usbappl.inf file. Right click and select Install. 3. Disconnect your iPhone and restart the computer. Actually you don't have to wrestle with iTunes all the time. A lots of outstanding iTunes alternative software like Tenorshare iCareFone serves the same. Compared with iTunes, it's much easier to operate and less likely to receive unknown errors like iTunes cannot connect your iPhone 6/6 Plus. File manager and Backup & Restore feature with iCareFone allows file syncing between your iPhone/iPad and PC/Mac selectively. The biggest difference with iTunes backup is that the files can be directly accessed after transferring. Except for data transferring, you can also use iCareFone to update iOS software, restore device from any stuck or fix recovery mode. After reading this article, do you have any further questions about how to fix iTunes on computer won't recognize iPhone 6/6 Plus/6s/6s Plus? Leave a comment below and we will get back to your as soon as possible. How to Fix "iTunes does not recognize your iPhone, iPad, iPod touch"
How to Fix "iTunes Cannot Read the Contents of iPhone/iPad/iPod"